Traditionally used for manufacturing in a hierarchical organization, the Japanese method to ensure upward communication can be adapted to the realities of today’s knowledge based, flat hierarchical firms to ensure effective 360-degree communication in which everyone stays in the loop. The concept of ho-ren-so, which are Japanese abbreviations for report, update and consult respectively, was originally developed for use in the manufacturing industry. It assumed a strict hierarchy, and the concept was designed for factory-workers to send a continual stream of information up to their managers, to ensure that they could make decisions with full information. Ho-ren-so is a strictly one-way process, with no information being passed back down the hierarchy. In that model, it is assumed that all decisions are made at the top and passed back down the chain of command, with little to no feedback to what factory workers communicated upwards. Another major weakness is that decisions are concentrated at the top, which often leads to slow decisions and a lack of empowerment among employees. While it may work in a manufacturing environment, ho-ren-so in its present form simply does not work in the service industry. In today’s knowledge based economy, flat-organizations and fluid project teams are becoming the norm. The top managers of the past are giving way to project leaders, who may not hold exclusive formal authority over all team members. Associates are also well educated, and are less likely to follow decisions blindly, and want to be respected as a professional and for their professional opinion. With teams like that, full knowledge of the situation by all members of the team is essential to ensure project success. 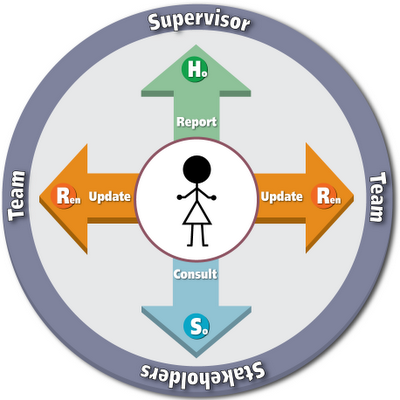 The new ho-ren-so model presented here focuses on 360-degree communication, to ensure that every one related to a project is kept informed and in-the-loop. With complete information, team members will be empowered to make decisions and act in the most productive way. It also ensures that the project moves quicker, as empowerment means that decision making is no longer concentrated in the hands of only one manager. Report to your supervisor or project leader, to communicate the situation and status, or to seek information or advice as necessary. Update your team members on the situation of your project, so that everyone knows what you’re doing. They will be able to take action accordingly, and work parallel with you. Consult with stakeholders, such as clients and those impacted by the project, to see whether this is what they want, and how you can improve. The new model takes the flat-hierarchy into consideration, and also accounts for the knowledge-based workforce we have today.